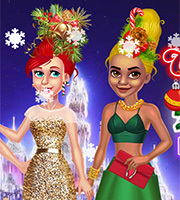 Description: Hope you don’t mind, but we have another crazy Christmas themed dress up game for you this week! Today we are going to blow your mind with some Christmas tree inspired hairstyles which is the next crazy beauty trend. 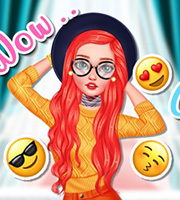 Now this fun, interesting and height-defying holiday hairstyle is so sophisticated and attention-drawing that the real challenge is to find the right winter outfit to go with it. 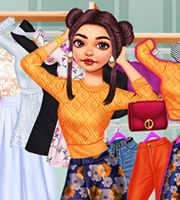 In our brand-new dress up game for girls we’ve gathered the cutest Christmas tree inspired hairstyles available on the internet, we’ve invited three of your favorite Disney Princesses - Elsa, Ariel and Moana - to try on these statement hairstyles and now we invite you ladies to browse through their Christmassy wardrobes and choose the loveliest holiday outfit for each of them. 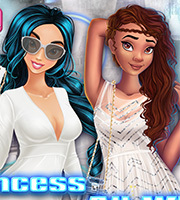 Get the game started to join the girls in and begin by selecting your favorite Christmas tree inspired hairstyle for each one of our girls. The hairstyles mimicking a Christmas tree are already decorated with ornaments, lights and other Christmassy details and you will definitely going to have a hard time choosing only three. Take your time and once the main decision was taken you can then move on and start picking their holiday outfits, too. In their special wardrobes you can find everything you need for this challenging dressing session: there are ugly Christmas sweaters (of course), ugly Christmas dresses (oh yeah), Santa costumes, there are glitzy dresses too, high heeled shoes and some of the sweetest jewelries you’ve ever seen… mix and match everything you like and put together three holiday looks which will perfectly complement the Christmas tree inspired hairstyles. Have a blast and make sure to share your creation in a comment below!